When we speak to Mike Portnoy for his first interview with us in more than five years, we do so at a perfect time for sitting back and taking stock. Never mind so much what has gone in Portnoy’s 50 years, there has been a staggering amount of activity in just the half-decade that has passed since he last graced the cover of this very magazine. Looking back to that last interview, Portnoy at that time was still dealing with the aftermath of parting ways with his band of 25 years, the band that he co-founded in 1985, Dream Theater. How did he deal with this painful split? He threw himself into music and he has barely stopped since. In fact, scratch that, he hasn’t stopped since. From the poppy Flying Colors to the hard-edged Metal Allegiance via his trio of projects with Neal Morse and sitting in on Twisted Sister’s farewell tour Portnoy, has been a busy boy. His latest project sees the New Yorker tackle that aforementioned Dream Theater split head on by returning to a batch of songs that address a major point in his life. On the drummer’s 33rd birthday he acknowledged that he needed help for alcohol and drug addictions. The experience formed the lyrical inspiration for the Portnoy-penned 12 Step Suite. This five-song set was recorded and released across a seven-year period spanning five Dream Theater albums (2002’s Six Degrees Of Inner Turbulence to 2009’s Black Cloud and Silver Linings). Now, with 17 years of sobriety under his belt, Portnoy is, for the very first time, performing the suite in its entirety on a whistle-stop batch of dates across Europe dubbed the Shattered Fortress tour. As Portnoy prepares for this cathartic experience touching on two painful moments of his life – battles with addiction and the road to recovery from his split with Dream Theater - we checked back in with the prog master to reflect on a whirlwind time for a workaholic drummer. Mike, with so many projects on the go for you, where do we start?! “I’ve been concentrating on the Neal Morse Band so far in 2017. We’ve played the US, Europe and the UK and we’re going to South America. It is an incredible band and we’re supporting our new double concept album The Similitude Of A Dream. Are you suggesting it is some of your finest drum work? “I don’t always look at my work in terms of drumming. When we finished this latest album and I came out saying it is one of the best things I have done a lot of people misinterpreted that thinking that I was talking in terms of drums. That’s not really the case. I don’t think it is one of my greatest drumming albums. “On this album I was more focused on the overall creativity and presentation. When I listen to this album from start to finish it moves me in the way that The Wall or Tommy moves me. It is a journey and is very theatrical. "When I listen to The Wall or Tommy they are not necessarily the greatest drumming albums of all time either, but they move me on an emotional and musical level. When I listen to The Wall or Tommy they are not necessarily the greatest drumming albums of all time either, but they move me on an emotional and musical level. “That is what I would say about this album. Sure, there’s some great drumming on there that I’m proud of, but when I make records drums are one fraction of my focus. “This marks our 18th studio album together. That’s almost double my output with Dream Theater. We have a deep musical connection. We’re in three bands together - the Neal Morse Band, Flying Colors and Transatlantic. "We have a connection on a musical and personal level. He’s one of my favourite songwriters in the world and I include all of my heroes in that. I think he’s up there with Lennon and McCartney and Roger Waters. We create some amazing music together. Are you involved in writing with Neal? “We’ve added the word band to the name starting from the album before this one. We’ve transitioned from Neal’s solo albums that I used to do into a fully-fledged collaborative band. We have a strong line up with every person at the top of their game. We’re all very creative people. Is it difficult to remain fresh when working with someone in three different bands? ...it’s not the drums, it’s the drummer. I can be just as effective on a five-piece kit as I can be on a 25-piece kit. Do you have distinct differing drumming outlooks and approaches for each project? “First and foremost, I always play for the song and for the music. That goes across the board. I need to serve the style that I am working in. With mine and Neal’s bands we’re working in three different genres with a lot of crossing the lines and a lot of separation. "With the Neal Morse Band we’re doing progressive music with a harder edge, it’s a little more in Dream Theater territory for me. Flying Colors is a little more poppy, it’s more Radiohead, Muse and Coldplay territory so I approach that drumming in a different way. "Transatlantic is more old-school classic rock and prog in the vein of Genesis and Yes. In each case I have to morph to the situation. I have to be a chameleon. It’s not only in terms of drumming and the way I approach writing drum parts, it is also my role within the band that has to change. Is there much crossover in terms of gear between projects or do you have different kits for each? “I have to evolve my kit the same way that I evolve my role. I have to do what is right for the music. At this stage I have broken it down to three levels of kits; small, medium and large. "I usually use the large kits for the more metal things like Metal Allegiance and Twisted Sister. The medium kit is for more of my prog-y things like most of the things I do with Neal Morse. With Neal I will usually use a single bass drum and three rack toms. I’ve also been enjoying using a small kit as well. "When I first came out with the Winery Dogs I had a Bonham set-up. That was such a departure from the huge kits that I had become known for. It was really enjoyable. Not to be brash, but I have won every drummer award on earth that there is to possibly win. At this point, I don’t need to prove anything to anybody, including myself. Does it require a different mindset when sitting behind a one-up, two-down kit as opposed to a sea of toms? “It’s a different mindset but it’s not a challenge. You can put me in front of any kit and it is a fun thing to have to adapt. It inspires me to try different things. I like that. With so many projects to juggle is it difficult to not repeat yourself and overuse go-to beats and fills? “I think that is something I am guilty of, to be honest. I have my style, I have my fills, I have my sound. "I think that is a good thing in a lot of respects. I like that I can do a full-on thrash Metal Allegiance album and then I can do Flying Colors full-on pop and you can still tell it is Mike Portnoy playing drums. The concept of time off for you seems bizarre, but if you had a month off is there anything you’d like to sit behind the kit and work on? “The last thing I want to do when I get home is play drums. I have maybe eight different kits set up in my house. I have one of my Siamese Monster kits set up in my office. "My house is filled with kits, it’s like a drum museum. But when I get home I don’t want to sit behind the drums, I’d rather sit by the pool with my dogs. That’s probably not the greatest thing to admit in a drum magazine but it is my reality. 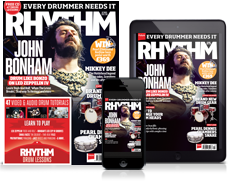 "I’m not the sort of drummer at this point who practices and needs to learn more. I will be 50 years old tomorrow and I know who I am, I am very comfortable in my own skin. “Not to be brash, but I have won every drummer award on earth that there is to possibly win. At this point, I don’t need to prove anything to anybody, including myself. "I know my capabilities but I am also incredibly aware of my limitations. I see young drummers today, including my own son, who do things that I absolutely can’t do, things that I’m physically not capable of. "There’s part of me that could think I will go home and shed for 12 hours a day and learn all of these things, but to be honest with you at this stage in my life I have other things in my life that I would rather spend that time doing. "I spend so much of my time as it is behind the drums on tour and in the studios with my 87 different bands. When I get home I went to kick back with my family and sit down and watch Fargo and Twin Peaks. “I did two summers of touring with them and both were very emotional for different reasons. The first tour was very emotional because AJ had just passed. The band and the fans were very emotional. "That was the second time I had stepped in because of a drummer passing away, with the first being Avenged Sevenfold. It was coming into a band with that emotion hanging over our heads. The last Twisted Sister tour I did was emotional because it was their farewell tour. “I’ve started albums with both bands. We started writing at Steve Morse’s place last December for the third Flying Colors album. We wrote seven songs and then had to put it on the shelf and go our separate ways because everybody has other things going on. The drive is no problem. That is something I can’t turn off. If I am fortunate enough to still be alive at 80 years old I will still have that drive and I will still be juggling 80 different bands. How do you manage to deal with the logistics of having so many bands and projects? “I don’t have a personal manager or anything and I think that is why having so many projects works for me. You don’t have to go through somebody else to get to me, I deal with it all. I am a very OCD kind of person, so I have a constant finger on everything that I am doing. "I am very responsible with how I lay out my time. I have to always look ahead six to nine months. Even though right now I am busy with the Neal Morse Band and I have the Shattered Fortress shows coming up this summer and I have multiple sessions in the process, but I have to put things on the calendar for next year. You’re on the eve of your 50th birthday and busier than ever - what drives you? “The drive is no problem. That is something I can’t turn off. If I am fortunate enough to still be alive at 80 years old I will still have that drive and I will still be juggling 80 different bands. That is my nature. "The hard part is my body keeping up with my mind. The physical aspect of drumming is very demanding. It’s hard enough if you’re just in one band. But to be in four, five or six bands at any one time and jumping from one tour to the next takes its toll. How do you deal with that physical aspect of drumming and touring? “There’s two levels to it; one level is what you need to do to pull it off on stage. In that case I always warm up before playing so I never go on stage cold. But the other level is what you need to stay fit for the other 22 hours of the day that you’re not on stage. "My biggest fear is getting sick on tour. That’s why when we do meet and greets I don’t shake hands. That’s not to be rude, it’s just so I don’t get sick. It is horrible to get sick on the road. You’re touring this summer playing Dream Theater’s 12 Step Suite for the first time. Why is now the right time to firstly revisit Dream Theater material and secondly to play those particular songs? “It stemmed from my 50th birthday bash on Cruise To The Edge in February. I put on two concerts for that to span my entire career. I brought Flying Colors and Transatlantic on board, I did a set of Liquid Tension Experiment’s music and of course Dream Theater music needed to be represented because that was 25 years of my life. "When deciding what I wanted to play I thought it would be a good time to finally do the 12 Step Suite that I had written the lyrics for and was about my recovery. I never had the chance to perform it in its entirety before I left the band. “This was the perfect opportunity to get it out of my system and do it for the fans and myself once and for all. Once word got out about it I got offers from different festivals, so I’m doing a short run of these shows. "Now is the time. Let’s do it once, one time only just for this year. It’s going to be fun to revisit that music. I haven’t done that in the dozens of bands and albums and tours I have done since leaving the band, I haven’t played Dream Theater. Is it a cathartic experience to revisit this material? “It is. It is very therapeutic. It was very therapeutic to write those songs. When I wrote them I was deep into my sobriety and step work. Me writing about each of those steps in each of those songs was me doing step work. "Now, it’s another level of therapy to complete the process and perform it. I think the performing of it isn’t so much therapeutic for me in terms of the lyrics and my sobriety, it is a little bit more of a catharsis for me now on a musical level. Is it a feeling of closing a chapter of your life? “It absolutely is the closing of a chapter. It is unfinished business and it is giving me some closure. I didn’t want to go to my grave having never performed this from start to finish. "It was a big, conceptual idea that I had and that I executed over the course of five albums in eight years and I never had the chance to see it through to its final presentation. Here we are 15 years later from beginning this to finally getting to do it. "Honestly, it is sad that it’s not with the guys from Dream Theater. I would have preferred that but they have made it very clear that they have no intent of ever reuniting with me, at least as of this moment. How about on a musical level, has it been challenging to revisit those Dream Theater drum parts? “It’s funny, I am known for having an elephant’s memory and people make fun of me for showing up for rehearsals and gigs without listening to the music, it is just in my memory bank. "I can jump from gig to gig to gig and play shows without re-learning the songs. Right before the rehearsals for the birthday bash cruise, I listened to the Dream Theater songs a few nights before to refresh my memory. I have to be honest, there was a moment of panic when listening to these tunes. "They are very complex. There are a million time signatures and changes. I thought, ‘Oh my god, I should have probably been preparing for this a little bit better.’ But the next day I sat down and it was like riding a bicycle, every single nuance was there, I didn’t even have to think about it. "You just don’t forget these things so my elephant memory came through. There’s a lot of complex music but I was a big part of writing that music so it wasn’t like I had to learn this incredibly complex music just thinking of the drums. Those songs discuss your sobriety and on your 50th birthday you celebrate 17 years sober; how big an impact has that decision to clean up had on your life? “It was something I had to do in order to survive. There came a point in my early thirties where I knew I could no longer control my alcoholism and my drug addiction and it was controlling me. "If you’re an OCD control freak like me then that is a scary thing to have a substance that is controlling you. There came a point, it was my 33rd birthday, and I was sick and tired of being sick and tired and I needed to do something about it. "I had tried quitting on my own 100 times throughout my twenties and early thirties and I could never last 24 hours before consuming again. I knew if I was really serious about it and if I wanted to get sober then I needed to get help. "That’s when I started going to meetings and I incorporated the 12 steps into my life and I wrote those songs around them. I think if I hadn’t done that I wouldn’t be here today. "I would have been one of those rock ‘n’ roll drug and alcohol casualties. It was heading in that direction. I don’t think I would have made it to 40. “I thank God that when I got to that fork in the road I made a decision that saved my life. Here I am today with both of my kids growing up and I am here to see that. To me, when I was 33 that was my biggest fear, my kids were newborns and the thought of not being there for them scared me into sobriety. Dream Theater was your primary band for 25 years. Did leaving give you a degree of freedom that has led to you launching so many bands in the last six years? “It has been liberating, that is the perfect word for it. I feel such a freedom now in my career that I can do whatever I want, whenever I want with whomever I want. "Make no mistake about it, I was very busy even when I was in Dream Theater. I did a lot while I was running the ship with Dream Theater. I have always been a workaholic. "I have always been very driven to do different things. But, with all of those years in Dream Theater that was my main band and that was my home. After a while, after 25 years of it, I just needed to move on and do different things. The feeling of liberation since I left the band has exploded. With bands like Dream Theater and Transatlantic you are playing incredible complex parts and odd time, but with feel. Would you agree with that assessment? “A lot of people jump to the conclusion that I am obsessed with technique. Maybe that is because of the technical progressive music that I have made a career playing and perhaps because I am very well versed in odd time signatures. "People think I spend a lot of time thinking about technique. That could not be further from the truth. I really have always been the sort of drummer that puts a much higher priority on feel and performance. There are a lot of progressive drummers that when you go and see them live they look bored to tears. “There are a lot of progressive drummers that when you go and see them live they look bored to tears. They are so consumed with being perfect that they are boring. I, personally, would much rather watch Lars Ulrich or Keith Moon live on stage, as sloppy as they may be. "To me, they are entertaining and they put a smile on my face and make me want to play drums. I would rather watch a drummer that makes me want to play drums rather than a drummer that makes me want to quit playing drums. To me, all of those technical drummers do the latter and where is the fun in that? “Even though I can easily play 19/16 time or 13/8 or 11/8, I know that stuff and I did go to Berklee and learned about that stuff and all of the other things about music that aren’t just about the drums like arranging. "I learned all of that not because I wanted to but to because I needed to. It is good to have that ammunition in the back of your mind for when you need it when you want to create and communicate with other musicians.